Confused about FTTC availability. . . .
Hi all, thanks for reading. I"d like to apologise in advance for my ignorance! As some of you know I'm moving to the UK soon and am looking at apartment rental. I would love to rent in a location that has FTTC, and to make sure that I can get FTTC before I get a place. I'm looking for accommodation in areas with exchanges that (according to Think Broadband Maps) are FTTC enabled (such as Waltham Cross, for example). Do I then have to make sure that my local cabinet is FTTC enabled? Or are all cabinets, linking to that exchange, enabled for FTTC? What I have been doing is to look at the address of the proposed rental property, find the postcode and then put it into the BT Infinity postcode checker. Is correct? Is there a better way? Re: Confused about FTTC availability. . . . The definitive way to do this is to use your actual phone number. However until you have a phone number the best you can do is via the postcode as you are doing. This checker is better than the Infinity one, which just feeds off this but excludes any estimates below 15Mbps. Be aware that the estimates are still consistently low, though not as badly as they used to be. 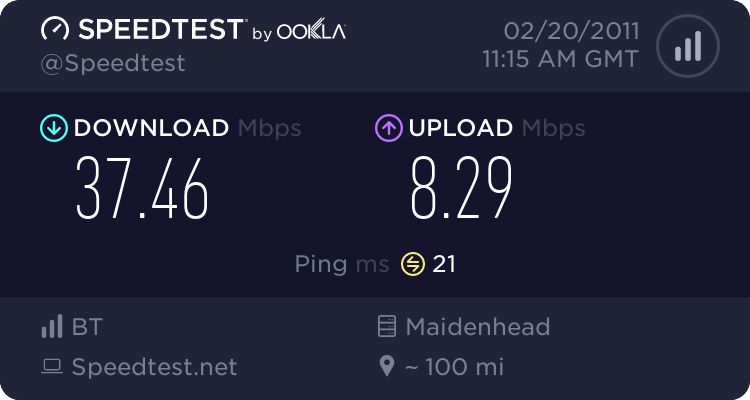 It is now possible to get FTTC with estimates of 5Mbps, (soon 2Mbps I believe), but I doubt if those would meet your criteria. FTTC requires the cabinet to be enabled, and this isn't done for all cabinets within an exchange area, so you do need to take care. Use the link given by someone else, it is definitely better than the Infinity one for the reasons given. a) The speed estimates come in a range that covers the entire postcode area. b) When a particular postcode is served by 2 different cabinets (or, worse, 2 cabinets on 2 different exchanges). You might not get service at some of the properties. There may be other special cases where a particular line cannot support FTTC, depending on the equipment already installed for voice (eg ISDN lines, or TPON). You may not see this distinction on a postcode search. The "phone number" search is definitive, so you should request help from the letting/estate agent for a final confirmation before signing anything. Yeah, the phone number is best, use that if you can get it/the property has one. If not, use the full address rather than postcode checker, it's not as accurate as the phone number check but better than just using the postcode. When I've looked at the availability data there are so many postcodes that are covered by more than 1 cab or 1 cab and exchange fed and in many cases 2 lines on one postcode can't both fibre.